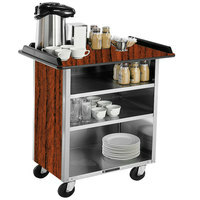 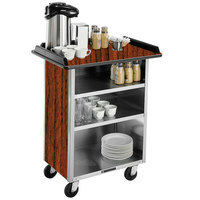 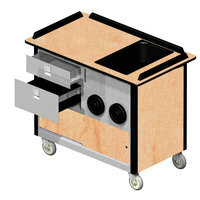 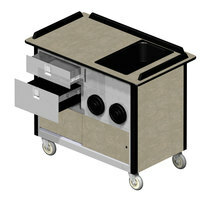 Choose a beverage service cart from our vast selection to make serving drinks and other snacks more convenient. From catering events to room service applications, these beverage service carts are a valuable addition to a wide range of establishments. When you invest in a service cart on wheels, you’ll experience easy maneuvering throughout crowded and tight spaces. Featuring storage compartments underneath and serving counters on top, each beverage service cart is designed with the user in mind. 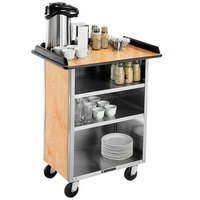 Keep extra serving cups, lids, stirrers, and other condiments on shelves for easy access. And, you can keep coffee airpots, water dispensers, and other serving supplies on top so guests can easily see what you’re serving. Choose from a variety of color, size, and material options to best complement the décor of your venue.